London’s Tower Bridge is likely the most photogenic bridge I’ve seen in my life. Although it’s not as massive as other famous bridges, it has a refined bit of charm and detail. Photographed here with David Wynne’s descriptively named ‘Girl with a Dolphin’ sculpture as the setting sun colored the sky. The Tower Bridge ended up being my most photographed subject in London, as we spent about an hour loitering around this area after sunset as blue hour and then nighttime changed the look of each image. Before heading to Europe, Sarah and I decided that we’d do so without the “shackles” of our smartphones. We elected not to rent phones, and instead to do the trip largely phone-free, using only WiFi. This was about as big of a mistake as we have ever made. On the first day, we found ourselves lost, at which point we quickly added on an overpriced data package to Sarah’s phone. We had to be conservative with how often we used this data, as we didn’t have much of it. So, most of the time when we wandered around, we relied upon paper maps. Occasionally we got lost, but this was no concern, and was actually a fun way to explore. The one day when time was of the essence, as we were trying to make our way to the Tower Bridge before the sun faded from the sky, we found ourselves walking the wrong direction due to our (lack of) navigational skills. Once we finally used Sarah’s map app to get turned around, we had about 20 minutes before sunset and a little over a mile from where we were to the Tower Bridge. I decided to make a run for it with my camera bag, tripod, and about 20 pounds of gear. Sarah elected to walk and just meet up with me later. My goal was to get a “sunburst” shot of the sun as it set, but by the time I arrived in a spot where that would work, the sun was just out of my frame. I did stumble upon this sculpture (along with a few others) on the Thames waterfront walkway, so I used it in my composition. Since I didn’t have a phone, it ended up taking Sarah and I about thirty minutes to find one another again (we actually got pretty lucky that we found each other so quickly). In the end, the running was probably worth it, as I’m pretty pleased with this shot. It wasn’t worth it, though, to do without the phone; we are too dependent upon our phones to completely cut the cord in a foreign country. Lesson learned: rent a phone when traveling abroad. For this photo, I used the Nikon D600 and the Nikon 14-24mm f/2.8. While I could have placed the sculpture on the left side of the frame and the bridge on the right by choosing a different angle, I chose this angle with the sculpture on the right of the frame for two reasons. First, so that the sculpture would balance the sunset instead of being against the sunset (I prefer the blue/sunset sky rather than a frame filled with sunset colors). Second, because the leading and converging lines of the handrail, bridge, and fountain simply looked better with this composition than anything else I could visualize (although I was in a hurry). As far as processing goes, this is technically HDR as it’s two photos (-2 & 0) merged together by hand in Photoshop CS6 using layer masks (no tonemapping). I could have used just the -2 frame by bringing out the shadows, but I wasn’t happy with how the blue was rendering when I did that. Instead, I used the -2 photo for only a small portion of the frame–right in the middle of the sunset. I finished the processing with a curves adjustment to give the photo a high contrast look, and increased the vibrance. How do you use your phone when traveling? Do you try to go off the grid, or do you use it like normal? Share your thoughts on this topic of the day…or anything else…in the comments. One lucky commenter might become the next Earl of Sandwich! On the subject of London- do you have any suggestions for where to get a Disney fix in London? We try to incorporate Disney into all of our trips and won’t be able to make a stop at any parks next year when we go to the UK. Commonly I don’t examine submit on blogs and forums, on the other hand would wish to claim that this write-up extremely compelled everyone to try and do the item! Ones composing tastes have been amazed myself. Appreciate it, very nice document. London has to be my favourite place to photograph. So many beautiful moments just around the corner. Especially on Southbank and around the Tower of London. Love this. Makes me want to get on a train and head straight there. For a large city, there really is a lot of diversity in photo subjects. You have modern, historic, etc. It’s great! Beautiful photo! I am so looking forward to my June 2013 UK trip and will do my best to seek out this spot for my photo collection. I love the sky in that picture. I’ve made the same mistake as you! When we traveled the UK (2006, pre-smartphone days), we turned down the option of renting a GPS from Hertz because we had good maps. Little did I know how many towns in the UK don’t use street names. …or have street signs in non-obvious locations! To follow up…I did finally manage to shoot the bridge twice during the next couple of days. I grabbed some night shots the following day, and on our last morning there, I took almost the same shot as yours with completely different lighting. LOL. I took a photo from this exact location when I was there a couple years ago. I had returned from a long hike around Buckingham, Westminster, etc, and my kids were wiped. The underground was closed in that area of London and I set off on foot determined to make it to the Tower Bridge in time to get that sunburst/sunset shot. I never made it that far as I was exhausted and it would have been a 6 mile hike round trip from the hotel, but on the way back I did manage to almost get lost after crossing the Millenium Bridge. I was heading for another underground station which turned out to be closed and had to walk back through several empty streets and I was VERY worried about getting jumped by some hooligans out to grab my camera gear. My shot of the Millenium Bridge on flickr was taken the same night. We did purchase a data plan while we were out there, but it turned out to be worthless as we were only able to access it like TWICE during the entire trip. Such a ripoff! Very cool shot here Tom. Interesting to see the sun in such a different position compared to the night before solstice in June. Did you ever post that photo on Flickr? I don’t recall seeing any of the Tower Bridge from you (or any of London at all, for that matter). We got lost later this night in what sounds like a similar way that you got lost. We had fun in the process though–saw some cool little corners of London! We had the same issue using the data (although it didn’t seem that bad). We found ourselves stepping inside McDonald’s here and there for free WiFi! Lovely picture. Love the color of it, really make the bridge pop out. I went to London myself this summer and I always took picture of it from the other side of the Thames and other side of the bridge. I now wish I went on this side but we never ventured that far. I can see why you’d stay on the other side, as I think that’s where most of the photogenic buildings are in that part of town. There’s always next time, though! I think what I like most about this photo is the combination of the sculpture and the bridge. That and the change in sky color across the frame. 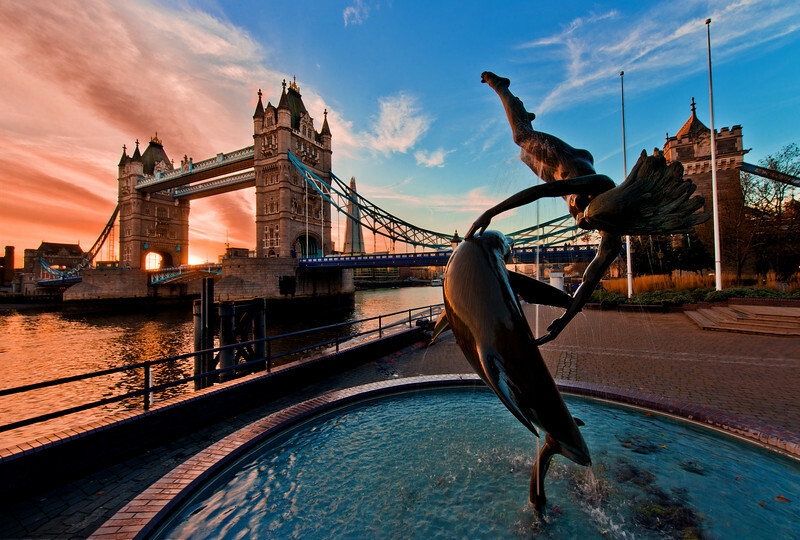 There are a zillion photos of Tower Bridge, but I have never seen this sculpture. Having the two together gives more of a sense of place to the photo. Congratulations on the new site. I’m excited to see how both sites will continue to grow. Thanks! I really like the color shift, too, and I think a blue and orange sunset sky is much more visually pleasing than a sky filled mostly with oranges. I’ve seen other photos of this sculpture, but only because I Googled “woman dolphin sculpture London” to find out what it was actually called. Turns out it had no special name.